We’ve all heard the hateful language that has been bandied about concerning our country’s past and our present. As we’ve watched the story unfold in the news before our very eyes, we’ve seen intolerance, bigotry, hatred, and violence at work nearby. It’s time we sent another strong message that we stand behind our community and resolve to do our best to protect it from those who might attempt to tear it apart. We cannot stand idly by as the vitriol and vortex of hatred grow. That is not the Nashville way and, lest we forget: WE ARE NASHVILLE! In an effort to take a stand in support of ALL Nashvillians, we plan to take out a full page ad in The Tennessean with the below language. We need your help by listing your name in support of this statement. We ask that you review this language, and give us permission to list your name on the ad. This is a timely matter, and we need to move quickly. Please support this effort by putting your name on the list, and share this opportunity with as many others as you can. On behalf of Nashville Unites and its leadership which includes Bishop Joseph W. Walker III, Ben R. Rechter, and William C. Koch, Jr., thank you for your consideration. 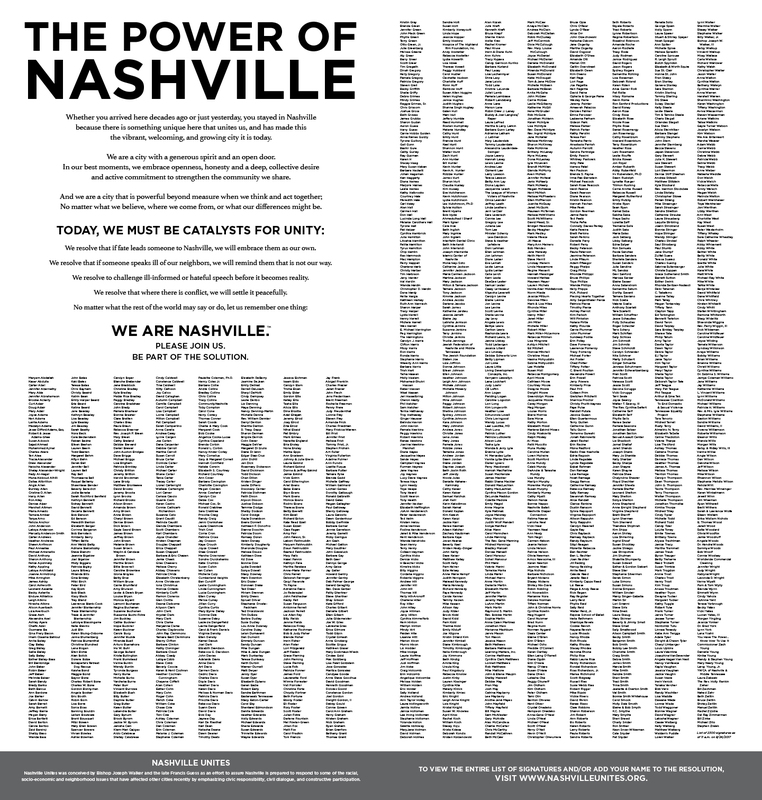 UPDATE: Our ad was placed and ran in the Tennessean on Sunday, August 27 with 2,300 names. We are still collecting signatures below and updating the list digitally at NashvilleUnites.org. unique here that unites us, and has made this the vibrant, welcoming, and growing city it is today. We are a city with a generous spirit and an open door. collective desire to strengthen the community we share. what we believe, where we come from, or what our differences might be. for the kind of bigotry, hatred and violence we saw in Virginia. We resolve that if fate leads someone to Nashville, we will embrace them as our own. We resolve that if someone speaks ill of our neighbors, we will remind them that is not our way. We resolve to challenge ill-informed or hateful speech before it becomes reality. We resolve that where there is conflict, we will settle it peacefully. Nashville Unites was conceived by Bishop Joseph Walker and the late Francis Guess as an effort to assure Nashville is prepared to respond to some of the racial, socio-economic and neighborhood issues that have affected other cities recently by emphasizing civic responsibility, civil dialogue, and constructive participation.